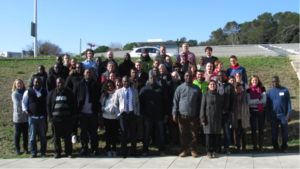 In February 2018, Future Climate for Africa (FCFA) programme’s AMMA-2050 research consortium held its annual meeting at the Agropolis centre in Montpellier, France. The meeting was part of the annual review and planning process carried out with team members from Senegal, Burkina Faso, France and the UK. AMMA-2050 is working to better understand high impact weather events across West Africa with a focus on climate smart agriculture in Senegal and flood resilience in urban areas in Burkina Faso. The project aims to support planning, policymaking and practice under changing climatic conditions. A training session for consortium members on engaging stakeholders in-country. Keynote speeches to introduce other projects that could be potential collaborators for AMMA-2050. These included presentations by Prof. Christof Bouvier on the RainCell project working on flooding in Ougadougou, Burkina Faso and Barbara Evans on the water, sanitation and hygiene work of FCFA’s HyCRISTAL in east African cities. On-going cross-fertilization of ideas across different work packages in the project to coordinate contributions to project delivery. Significant progress has been registered towards projects goals over the past year. For example, on the climate science and modeling front, atlases of climate metrics were developed for case countries and wider regions across West Africa. The atlases present the various future changes in climate compared to the past. Another highlight of the climate science outputs of the project was a publication that shows the tripling of intense storms in West Africa over the past three decades as a consequence of global warming. The research is published in Nature and reported on the FCFA website and Nature’s website. The above results set the scene for understanding the risk climate change poses to livelihoods and development in the region. For instance, in Burkina Faso, a database of flooding events developed by the project shows that 77 flooding events have occurred since 1986. These kinds of extreme climatic events threaten livelihoods and economic activities of rapidly expanding cities like Ougadougou, especially in light of the increasing number of informal settlements. As such, planners are interested in knowing how vulnerable urban communities and infrastructure are to such flood events, how the climate hazard may evolve in the future, and what can be done to respond. AMMA-2050 is making strides to address such questions. Progress has also been made in understanding how emerging climatic changes will likely affect future economic activity and livelihoods, particularly in the agricultural sector and the effects of related flooding events. Researchers have set-up various models to address this task. An interesting development is the process of coupling some hydrologic models with crop models. This is a scientific novelty that will allow for a better understanding of farmers’ options for water supply and irrigation in the future. During the annual event, engaging cross-discipline discussions occurred around how to ensure that science informs planning, policy and practice, a key aim of the project. Significant interest has been generated from stakeholders ranging from ministers and planning committees, to mayors to farming communities in the two case countries (Burkina Faso and Senegal). These stakeholders are reported to appreciate the importance of climate information in their activities and efforts to address climatic hazards now and in the future (although demand is predominantly on short time-scales). Stakeholders are demonstrating growing confidence in engaging the scientific community and articulating their climate information needs, which is encouraging. It also supports the project’s efforts in co-production, meaning the work of scientists is adjusted towards meeting the needs of users and decision makers. During the rest of this year, AMMA-2050 plans to focus on increasing engagement with decision makers and planners on emerging climate information. Innovative engagement tools such as theatre and games are being used to involve users and decision makers. A theatre piece developed under a separate project to engage farming communities in Senegal on genetic resources was screened during the event. Based on AMMA-2050’s work in Senegal a new theatre piece is being developed for similar purposes. 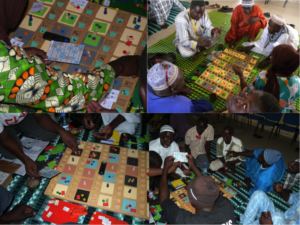 In addition, an exercise called “the plateau game” is being adapted to encourage farming communities to discuss climate change and ensure that farmer-drawn adaptation options inform adaptation-modeling process to improve realism. As these and other tools continue to be used in the project, this coming year of research and engagement promises to yield interesting insights about climate research into use.